In idyllic Rosewood, Pennsylvania, four very pretty girls just can't help but be bad. . . .
Hanna will do anything to be Rosewood's queen bee. Spencer's digging up her family's secrets. Emily can't stop thinking about her new boyfriend. And Aria approves a little too strongly of her mom's taste in men. Now that Ali's killer is finally behind bars, the girls think they're safe. But those who forget the past are condemned to repeat it. And they should know by now that I'm always watching. . . . I would have a difficult time deciding to recommend this book to a friend. I would say yes, due to the fact I enjoy the first four (first arc), and they might enjoy continuing. However, I would also say no due to the fact I did not care for this book. I felt like there was not really anything happening, and it made me dislike my favorite liar, Hanna. I would say, yes to a die hard fan. 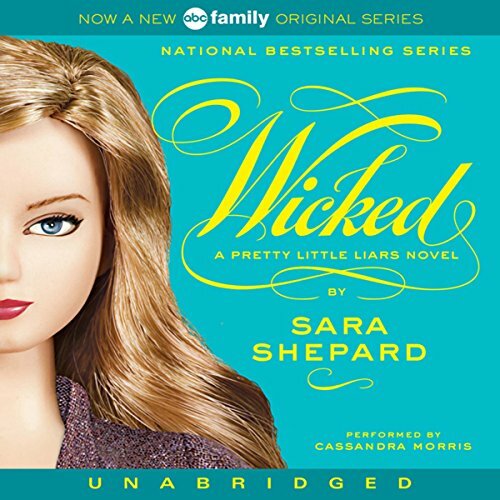 If you’ve listened to books by Sara Shepard before, how does this one compare? I have listened to many books by Sara Shepard before, actually, I listened to The Perfectionist literally before this one. This one did not compare to her other books. I felt like not much happened right then. Which character – as performed by Cassandra Morris – was your favorite? My favorite character is always Hanna, but sadly, she made me dislike her with her attitude in the book. But, I will stick with her and say Hanna was my favorite. I also like A. Was Wicked worth the listening time? No, I feel that Wicked was not work my listening time, and I regret using a credit to purchase this title. I adored the first arc, the first four books, but this made me sad and not want to continue the series. I do not like saying that, but that is how I feel. Of course, I am an adult, so this might be greatly different for a young adult reader. What did you love best about Wicked? I liked the fact that Spencer may not be a Hastings. What was one of the most memorable moments of Wicked? Ian being killed because I do not think he killed Allison. The girls are back to their normal life now that “A” has been reviled and Ali’s killer is in jail. Well, it starts that way anyways but soon there is trouble with Ali’s killer and a new “A” is starting back where the old “A” left off. If you enjoyed the first four books of this series I am sure you will like this one also. It gets frustrating that the girls never seem to learn from their mistakes but hey if they did the books would not be so entertaining.